Vada's Blog Stamp Inks and Paper : To My Dearest. My punch is from Martha Stewart and it’s called “French Scroll”. There is four layers that have been layered with foam and raised, the “3D” affect. My little graphic is from “Magic Moonlight Graphic’s”. 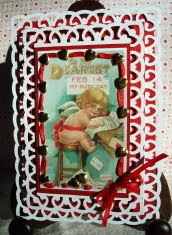 I ran red ribbon around the edge and added gold heart brads. Enjoy the week-end, “Go Packers”!!!! Quite LOVELY! Wonderful inspiration since I too have some of those! 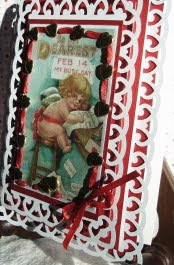 A really sweet Valentine's card, love the edging. 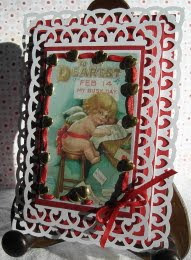 Vada, the beautiful punching adds so much elegance to this Valentine Days card. Adorable little image! I knew and worked with John Brockington a former GB Packer.